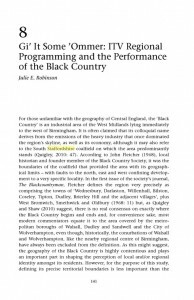 The new academic book Regional Aesthetics: Mapping UK Media Cultures has a chapter on ITV’s screen representations of some aspects of Black Country traditions and ways-of-life. ITV’s regional programming in the early 1970s reflected that particular moment in our history when there was an emerging awareness of the enormity of what was being lost in the rapid erosion of English traditions, and the knowledge (among intellectuals, mostly) that many aspects of a once-living folk-life were already quietly slipping away into dusty academic libraries and archives. I’d note that this was paralleled by the sudden and strong revival of localist fantasy and ‘earth mysteries’ in the 1970s, which rediscovered past Midlands-linked glories such as The Lord of the Rings and which expressed itself in a variety of highly influential children’s novels (Alan Garner, et al). To a lesser extent it also reached the screen, in works such as Penda’s Fen. Such works of imaginative claiming and re-adaptation were made all the more profound, since they were being shadowed by the very real losses and fragilities recorded by the likes of ITV. The chapter’s author initially feels the need to chide the more lumpen sort of media studies academic, the sort who tends to see TV as manipulative and constructive of a false consciousness among ‘the masses’. Personally I have no problem with a sympathetic media playing a large role in the reconstruction and adaption of tradition. In my view it always has had that role, from the bardic ballads onward. One of the great English traditions is the invention of tradition, and then the deft elision and interweaving of this with real lives and wider histories. An example of the process in its nascent form might be 2016’s new Staffordshire Day on 1st May. Of course, such a process works best when it’s part of a conversational and quietly mutual re-construction that’s carried out across groups, and is usually best undertaken by a loose alliance of sympathetic thinkers and do-ers each located in very different strata of society. Often those thinkers and do-ers are traditionalists, but of the sort that knows tradition only works for people if it’s constantly re-made and re-worked. So they’re very different from the gloomy sort of fossilised conservatives (“bring back 1894!”), who are often such unimaginative pessimists that they form a de facto unholy alliance with the cynical and deconstructive left (“bring back 1984!”). Anyways, short clips from some of the ITV coverage discussed in the chapter can be seen online, such as “On the Road to Nowhere” (1974), the full version of which was on the out-of-print MACE DVD The Black Country 1969. The chapter also discusses the use of local poetry from The Blackcountryman magazine, as well as songs, used by ITV as a distilled localist commentary laid over their screen montages.